Three-dimensional conformal radiation therapy, or 3D-CRT, involves creating 3-D computer images and delivering highly focused radiation to tumors while sparing nearby healthy tissue. 3D-CRT is a type of external beam radiation therapy (EBRT), which is the most common radiation treatment used for mesothelioma. New methods of providing radiotherapy to mesothelioma patients make irradiating the affected area more precise. Conforming the radiation beam to the three-dimensional shape of the tumor reduces the risk of side effects. A treatment session of 3D-CRT typically lasts 15 to 30 minutes, although the first appointment may be longer. Intensity-modulated radiation therapy (IMRT) — an advanced form of 3D-CRT — is even safer and more effective for pleural mesothelioma. IMRT uses the precise 3D targeting of 3D-CRT but also changes the speed and strength of the radiation beams in certain areas. Two-dimensional images gathered from a patient’s CT scans, MRIs and PET scans are fed into a dome-shaped projector that rotates. This dome, which is plugged into a computer, projects the images as three-dimensional holograms. These are not pictorial images like the ones seen on other types of tests. Holograms are light images that indicate characteristics such as the size, shape and location of the tumor and the organs that surround it. Multileaf Collimator: This device attaches to the head of the radiation machine. It has rows of platelets that are separate from each other, known as leaves. The leaves can be manipulated to create the initial shape and size of the portal the beams are emitted through. Custom-Fabricated, Field-Shaping Blocks: These are made of a material such as lead that stops radiation. They are placed around the portal to further conform the radiation beams to the shape of the tumor. Radiation’s ideal role as part of multimodality treatment for mesothelioma is still being evaluated. 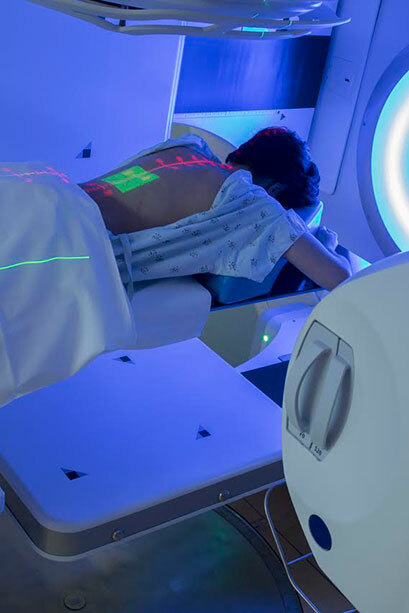 A part of that ongoing investigation is experimentation with how to deliver high doses of radiation to the chest without damaging normal tissue — especially within the lung. Research shows that after an extrapleural pneumonectomy (a surgery to remove a lung), it is possible to use 3D-CRT to deliver high doses of radiation without serious risk. However, the radiologist must be careful about exposing the remaining lung to radiation. Our Patient Advocates can help connect you or a loved one with the nation's top mesothelioma doctors and cancer centers. Three-dimensional conformal radiotherapy is a complex process that requires an experienced radiologist, especially when treating pleural mesothelioma patients. Some patients treated with 3D-CRT experience no side effects. When adverse effects do occur, they are generally related to the area of the body being treated. These side effects are usually not serious and go away within four to six weeks after treatment ends. Medication or changes to your diet can help control potential side effects. Radiation Pneumonitis: An inflammation of the lungs that typically starts within two to three months of the start of the radiotherapy. Its symptoms can include a dry cough, shortness of breath and low-grade fever. In rare cases, it can lead to permanent scarring of the lungs. Esophagitis: Occurs when the esophagus (the food tube that runs from the throat to the stomach) becomes inflamed. This condition typically starts about two weeks after the beginning of treatment and usually disappears about two to three weeks after treatment is completed. Mucositis: A condition where the lining of the mouth, throat and gums (called the oral mucosa) become inflamed. It is accompanied by dry mouth, thick saliva, sores and difficulty chewing or swallowing. It is also a temporary condition that ends within a few weeks of the completion of treatment. You should consult with your oncology team to determine if 3D-CRT is the best form of radiation or if radiation therapy is needed at all. Every mesothelioma case is unique. A mesothelioma specialist will be able to formulate the best treatment plan based on the location and size of tumors, staging of the cancer and your overall health. Sutter Health Palo Alto Medical Foundation. (n.d.). Three-Dimensional Conformal Radiotherapy. American Cancer Society. (2016, February 17). Radiation Therapy for Malignant Mesothelioma. American Cancer Society. (2017, February 10). External Beam Radiation. Stahel, R.A. et al. (2010, May). Malignant pleural mesothelioma: ESMO Clinical Practice Guidelines for diagnosis, treatment and follow-up. Science Daily. (2007, May 10). Targeted, high-energy cancer treatments get a supercomputing boost. Claude, L. et al. (2004, May). A prospective study on radiation pneumonitis following conformal radiation therapy in non-small-cell lung cancer: clinical and dosimetric factors analysis.